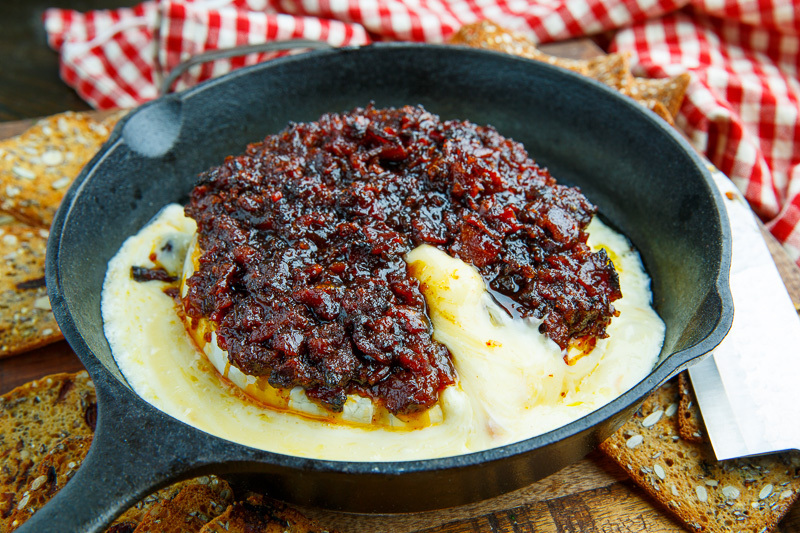 All of the amazing flavours of bacon jam served with gooey, gooey melted brie! Yum! 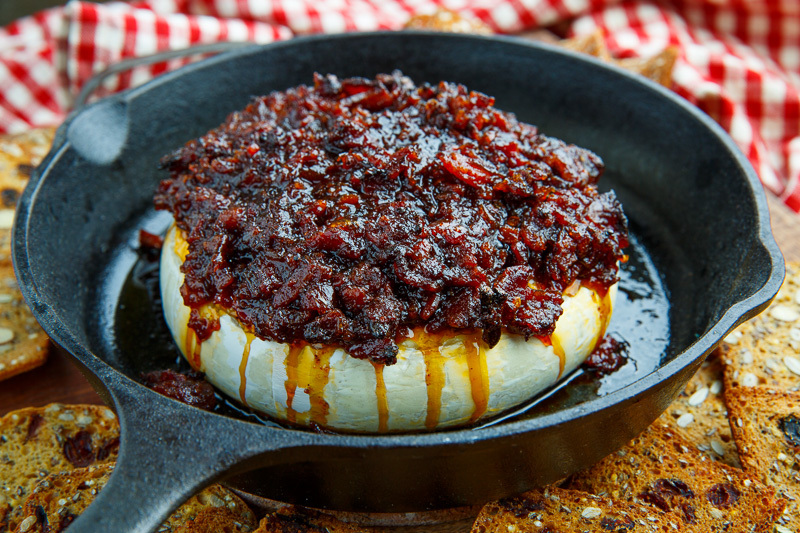 During the holidays I like to have a couple of quick and easy recipes on hand for entertaining and this bacon jam baked brie is on the top of my list right now! 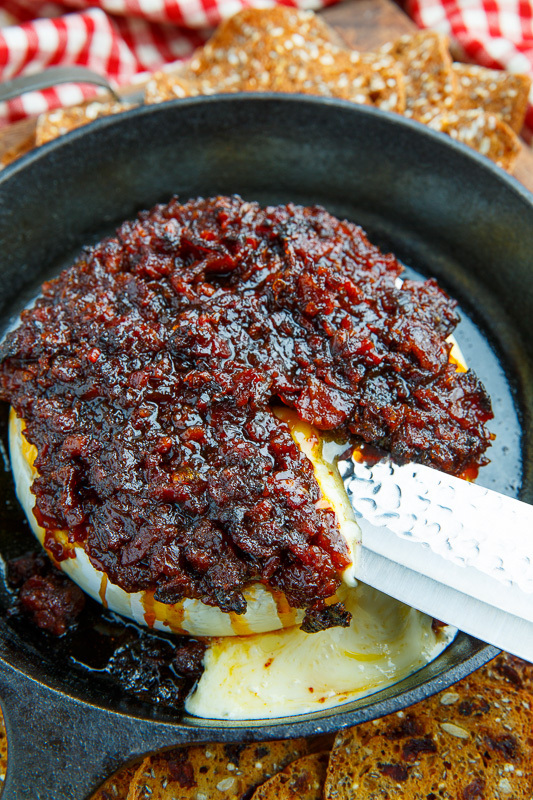 Bacon jam is a is a magical jam substance made with plenty of bacon, along with hints of maple syrup, coffee and chipotle chili heat that is perfect for eating by the spoonful and slathering on toast or in sandwiches. 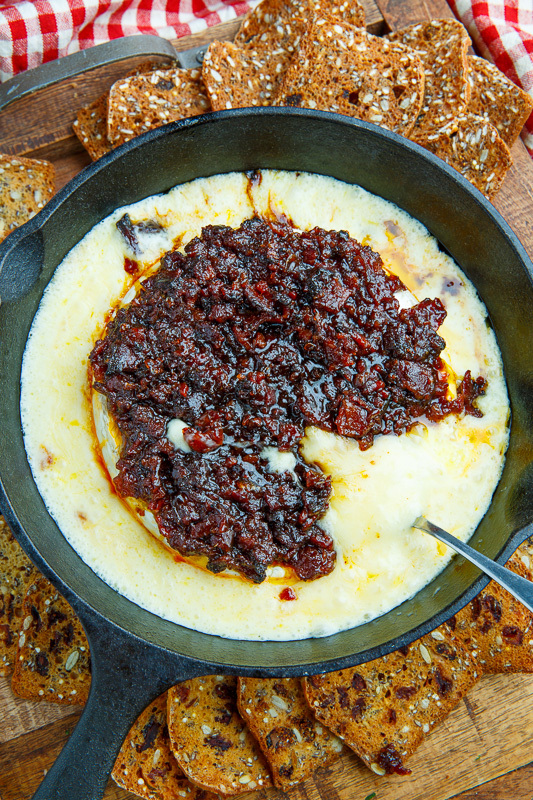 I usually like to just hoard all of the bacon jam for myself but it also makes for a great gifts and it can also be nice to share some at a gathering, especially when served warm on top of an ocean of melted brie cheese! 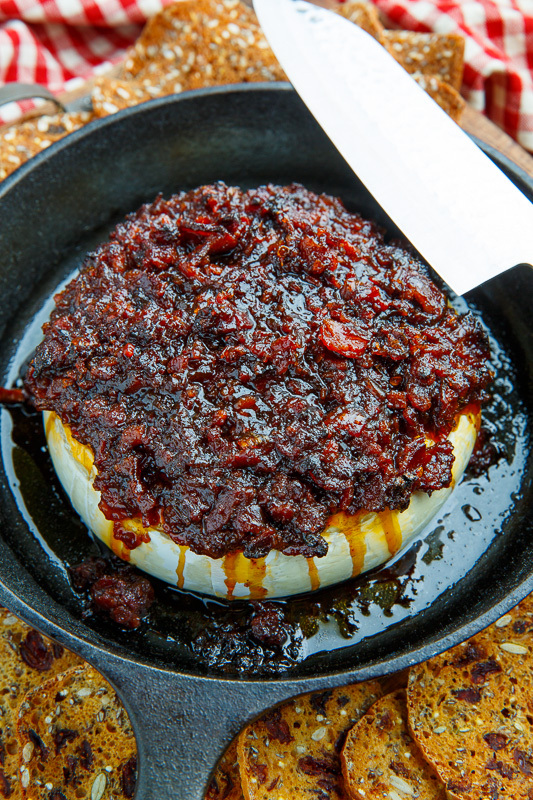 Baked brie could not be easier, you simply place a full wheel of brie in a baking pan, top it with a topping, like bacon jam, and bake it until the cheese melts! 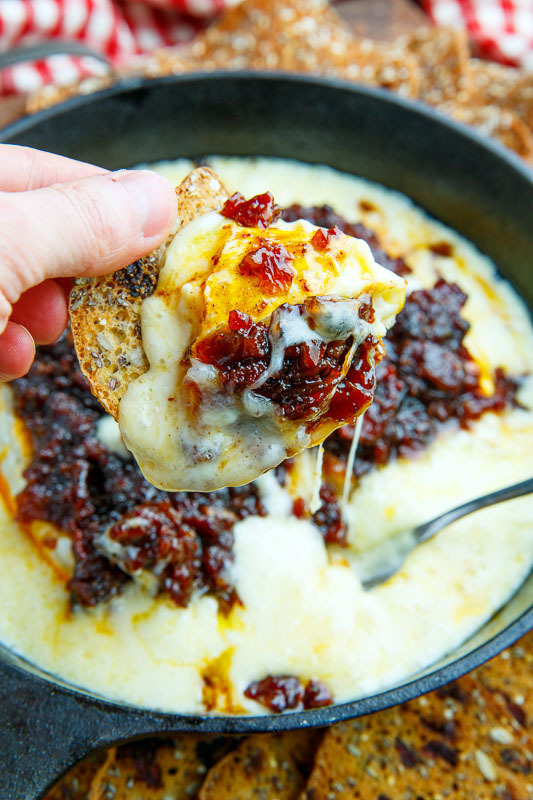 I like to serve this bacon jam baked brie along with a spoon and tasty crackers for scooping up all of that melted cheese and bacon jam! 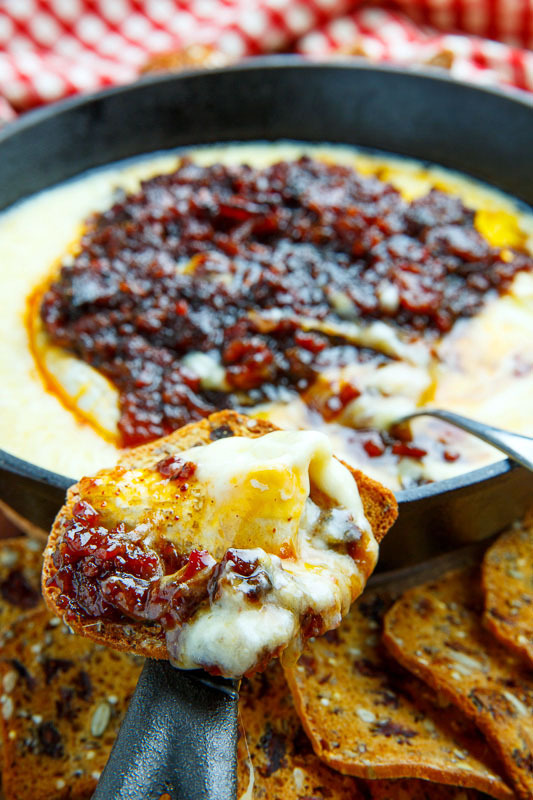 Place the brie in a baking pan, spread the bacon jam over the top and bake in a preheated 350F/180C oven until the cheese has melted, about 15 minutes, before letting it cool a bit and enjoying with crackers, on crostini, etc. Option: Wrap the brie, topped with the bacon jam, in puff pastry and bake until the puff pastry is lightly golden brown! You always make the best snacks! Although I do not comment often I love everything that you make and share a lot of your recipes! Happy Christmas to you. I am finding the advertising interferes with your blog – can you not change this? Do you remove the bacon from the pan and only process the other ingredients and then add the bacon back into it? or do you continue cooking bacon with onions, garlic, etc and then process it all? When you make the bacon jam, cook the bacon, set aside while you cook the onions and add the bacon back along with all of the other ingredients in step 4. Enjoy! Love me some bacon jam! I just made two triple batches, divided them into 1/2 pint canning jars and gave them out for Christmas! Those who’ve had it before generally squeal with delight; those that haven’t are kind of skeptical, but try it and beg for more! A question for you, though. What kind of crackers are you showing here? The crackers look amazingly yummy! Quick question Kevin, do you peel the brie I’ve seen that in a couple recipes), or just eat it with the skin on? This sounds amazing and I’d love to try for New Year’s. Thank you. In general you eat Brie with the skin on. 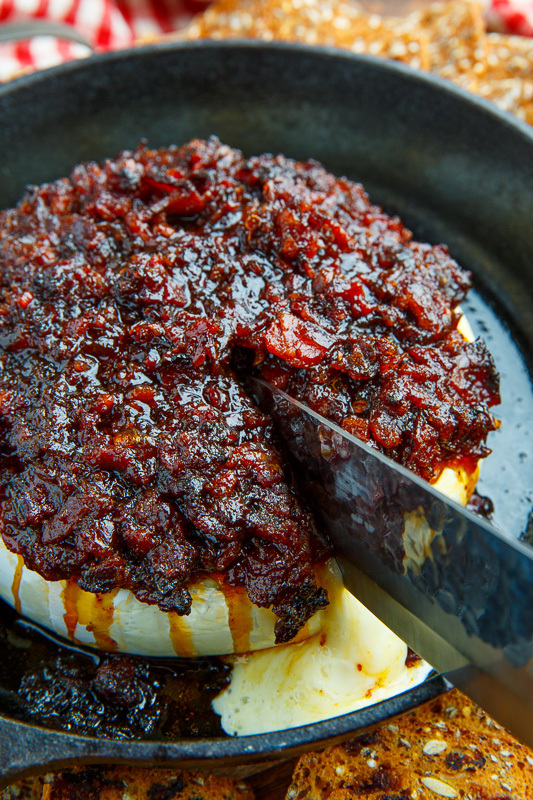 For baked Brie like this the skin helps contain all of the melted Brie as if bakes!